Is the Mayor’s Plan To Stop Dumping Garbage by 2030 Possible–or Just Trash Talk? 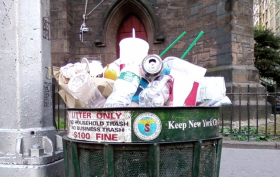 New Yorkers make a lot of garbage. We create more than 44 million pounds of residential and commercial waste every day–about a ton per person annually. Of that, only a third is recycled, composted or burned to generate energy. The rest is dumped in landfills. A recent Crain’s article explains how Mayor Bill de Blasio hopes to make a serious dent in all that dumping. He has pledged that by 2030, the city would be sending “zero waste” to landfills: “This is the way of the future if we’re going to save our Earth.” But like most things, the success of any plans to reduce the rubbish pile hinges on two things: management, and incentive (which, for most New Yorkers, means money). We’ve all been that person who puts their Starbucks cup on top of an already heaping and overflowing garbage can, especially since it seems more often than not that this is the state of our city’s waste bins. But if you’ve looked for a trash receptacle downtown recently, you might have been pleasantly surprised with the Bigbelly. 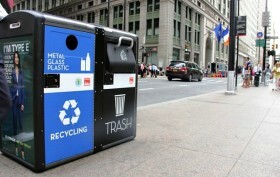 These solar-powered “smart” trash and recycling bins are “equipped with a chip that detects when the bin is full or too smelly, allowing trash collectors to make a pick-up where they’re needed most,” according to CityLab. And, as if that wasn’t enough, Bigbellies can double as Wi-Fi hotspots, providing enough bandwidth to power a small business. We’ve all seen those folks who callously toss their garbage into the street when there’s a trashcan just ten steps away. While most of us usually remain hush and pick up the slack, there’s a group out there that’s fed up with litter and they most certainly aren’t afraid to point fingers. 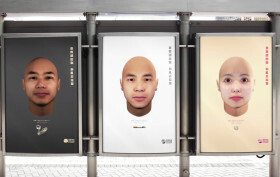 As part of a campaign developed by Ogilvy to help clean the streets of Hong Kong, activists including Hong Kong Cleanup, Ecozine, and The Nature Conservancy joined forces to give a face—or literally, faces—to the problem plaguing cities worldwide.